Brian is broadly interested in the ecology and conservation of birds, especially in the Guiana Shield of northeastern South America. 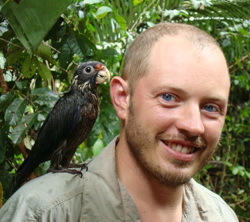 His research interests include the distribution, community dynamics, and spatial ecology of birds in lowland rainforest and coastal secondary forests of Guyana and Suriname. In each of these countries, he has initiated long-term banding projects at selected field sites to address questions of territory stability, community similarity, and species turnover in the context of changing land use. He maintains strong ties with local biologists, students, and NGOs, with whom he has collaborated on several survey expeditions to remote interior localities in the Guianas. His survey work has generated a wealth of information on avian distributions in the Guianas, with a keen interest in the use of these data in conservation. As a Research Associate with Global Wildlife Conservation, Dr. O’Shea has worked extensively with the Iwokrama Centre for Rainforest Conservation and Development, Conservation International, and the Worldwide Fund for Nature. O’Shea, B.J., and S. Ramcharan. 2013. A rapid assessment of the avifauna of the upper Palumeu watershed, southeastern Suriname. pp. 145-160 in Alonso, L.E., and T.H. Larsen (eds.) A rapid biological assessment of the upper Palumeu River watershed (Grensgebergte and Kasikasima) of southeastern Suriname. Conservation International, Arlington VA.
O’Shea, B.J., and O. Ottema. 2007. Environmental and social impact assessment for the proposed Bakhuis bauxite mining project. Specialist study: Ornithology. SRK Consulting, Cape Town, South Africa. O’Shea, B.J. 2005. Notes on birds of the Sipaliwini savanna and other localities in southern Suriname, with six new species for the country. Ornitologia Neotropical 16:361-370. Komar, O., B.J. O’Shea, A.T. Peterson, and A.G. Navarro-Siguenza. 2005. Evidence of latitudinal sexual segregation among Neotropical migratory birds wintering in Mexico. Auk 122:938-948.